You can’t just sit, or just stand; we’re designed to move. The Fehn chair combines movement and better posture to end work-day back pain and fatigue. Thank you for your support at SXSW! It was a great opportunity to meet all of you. We hope you enjoyed trying the Fehn. SXSW Coupon valid through 06/01. Check out Rhode Island Inno’s 50 on Fire list to find us in the design section! Standing or sitting for too long is a pain in the back. Made to use with standing desks, The Fehn lets you flow through multiple positions while you work— without having to buy (and store) multiple pieces of furniture. The Fehn’s ergonomic seat tilts forward at an angle, moving your pelvis into a neutral posture thereby reducing strain on your spine. 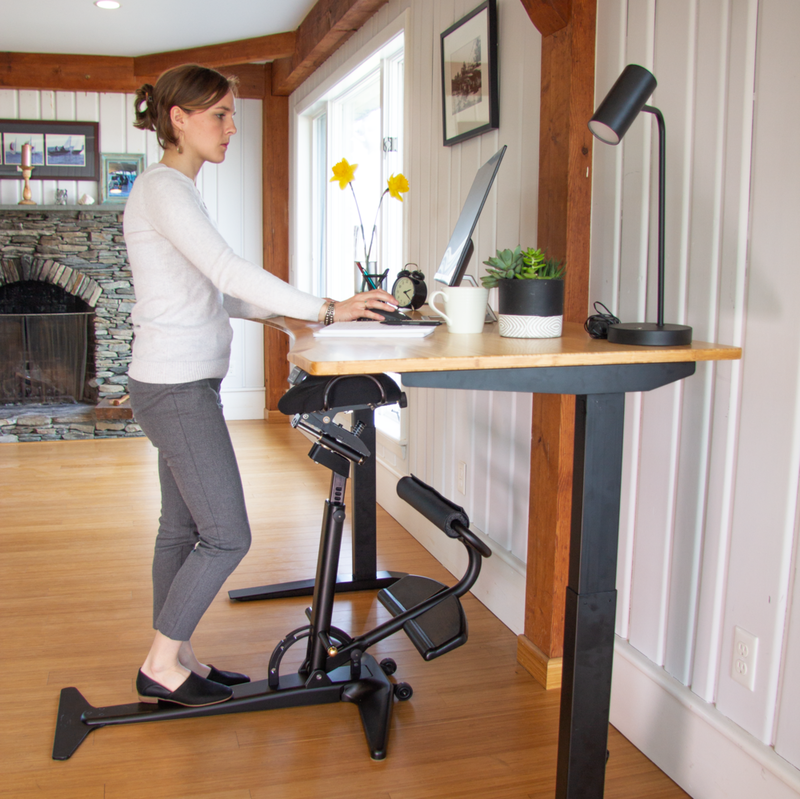 Mounted on a pivot, the Fehn frees you to rock, move, and stretch while you sit— without thinking about it. These small movements increase blood flow, relieving muscle strain and fatigue. When you don’t want to sit, the Fehn’s seat quickly and easily flips under your desk and out of your way: no adjusting your desk height or moving bulky furniture. It can also be folded all the way down into a compact shape for easy storage and transportation. Multiple foot rests allow you to naturally shift through a wide range of postures, whether you’re sitting or standing on The Fehn. You’re free to move, without sacrificing comfort or support. The upper foot rest doubles as a sit up and stretch bar, so you can sneak in some exercise or fully stretch your back while you work. We want to bring The Fehn to your office. Learn from our founder why we love the Fehn! Contact us to try it out! It’s time for an adjustment. Whether you’re sitting or standing, your work day is taking a toll on your body. The Fehn is uniquely designed to alleviate the back pain and fatigue associated with an 8-hour work day. When you sit, you put a ton of stress on your spine and back muscles— even in a thousand-dollar office chair. Sitting creates uneven pressure on your disks by rotating your pelvis backwards and pulling your spine out of its natural shape. The Fehn’s seat rates your pelvis into the correct position, allowing your spine to remain in the correct shape and relieving muscle strain by 40-90%. When you sit or stand in one position for too long, you also reduce the blood supply to your muscles. Insufficient circulation causes fatigue and increases your risk of muscle injury, as well as having serious negative consequences on your metabolism and cardiovascular health. The Fehn allows you to shift throughout the day, both subconsciously on the pivot-mounted seat and consciously as you sit, stand, and move your feet. When you keep your blood moving, you can focus better, feel less tired, and can get more done. We can’t wait to bring The Fehn to your office. Let us bring The Fehn to your office.